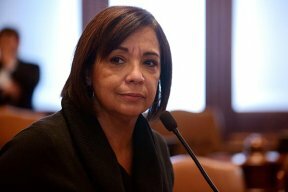 Martinez joined several other Democratic senators in calling for the Executive Inspector General of Illinois to investigate the distribution of state materials from Rauner’s administration to a political group funded by the governor’s campaign. State Senator Andy Manar (D-Bunker Hill), the bill’s sponsor, said at the press conference that documents incorrectly portraying the funding schools in Kankakee County would receive were sent to a politically-motivated publication. Manar had seen the documents on Thursday in a meeting with Rauner and had pointed out their errors. The Rauner administration has been vocal in its opposition to Manar’s legislation, claiming it “bails out” Chicago Public Schools. “I’m tired of hearing the term ‘bailing out CPS,’” Martinez said. SB 1 replaces the state’s current school funding formula with an evidence-based model. It passed the Senate 35-18 on Wednesday with no Republican support.